While Bangalore’s taxi aggregators are continuing to charge surge pricing rates despite a government order, it turns out that there’s now a way to get a refund – complaining to customer care. 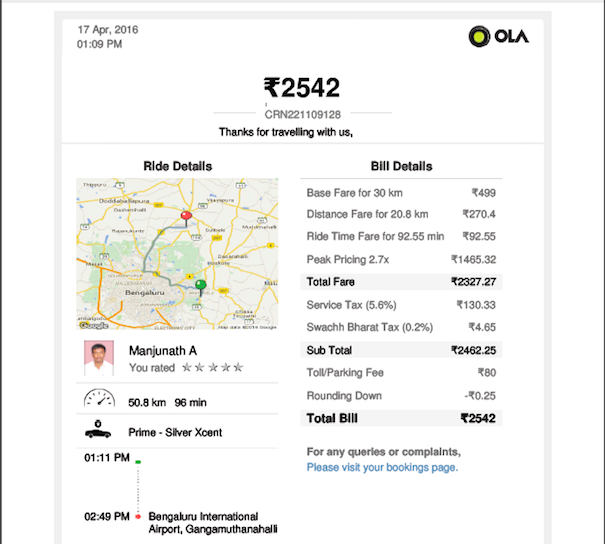 Bangalore resident Manish Verma took an Ola Prime to have his parents dropped to the Bangalore Airport. While booking the cab, Verma had noticed the 2.7x surge notification, but having read that the Karnataka government had put an end to surge pricing, booked the cab anyway. While the Ola Prime employs the normal fare of around Rs. 10 per km, Verma was in for a rude shock when his parents’ trip ended with a bill of Rs. 2542. Ola had charged him surge prices despite the government order. The government had mandated a ceiling of Rs. 19.5 per kilometer for rides, but he’d been charged way above that amount for his 20.8 km long trip. When Verma contacted Ola support, things got interesting. “I was told they have asked the government to give 1 month extension. Whether government has given the extension or not, they are not willing to tell me and why the same has not been communicated to customer, they are not answering. “, he tells OfficeChai. There has been no official communication about this one month extension, either from Ola or from the government. This incident highlights how fuzzy the rules around surge pricing in Bangalore are at the moment. While the government has come out with its order, cab aggregator apps are still showing surge prices. And to add to the confusion, customer service representatives are willing to slash prices for those who complain. The sooner the government comes out with a clear communication on the matter, the better.